Rolling hills of lush green grass, towering pines, swaying palms, languidly flowing streams and serene waterfalls – Nevada is your premier golf destination. With more than 100 courses to choose from, your clubs may need replacing before you run out of options. In the mood for a casual round on a low-key course? Take your pick of any number of fun, beautiful courses like Rosewood Lakes in Reno, Empire Ranch in Carson City or Painted Desert Golf Club in Las Vegas. Looking for something a little more challenging? 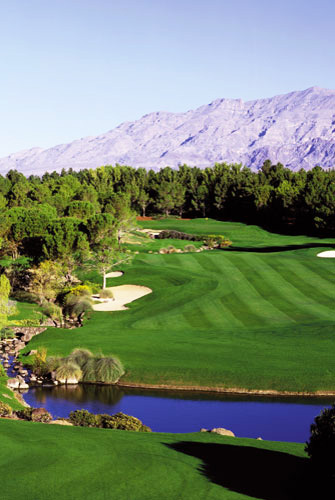 Nevada is home to a fantastic assortment of exclusive, PGA-caliber courses scattered at all ends of the state. Badlands Golf Club in Las Vegas has been ranked in Golf Digest’s “Top Ten Best Courses in Nevada” while Sports Illustrated declares Boulder City’s Cascata Golf Club “golf’s hidden treasure.” And that’s just the beginning.